The work “Princess Olga meets the body of Prince Igor” is not finished and is considered only a sketch. This picture was written by Surikov Vasily Ivanovich on a historical theme. We see here a very famous and recognizable story from the history of ancient Russia. 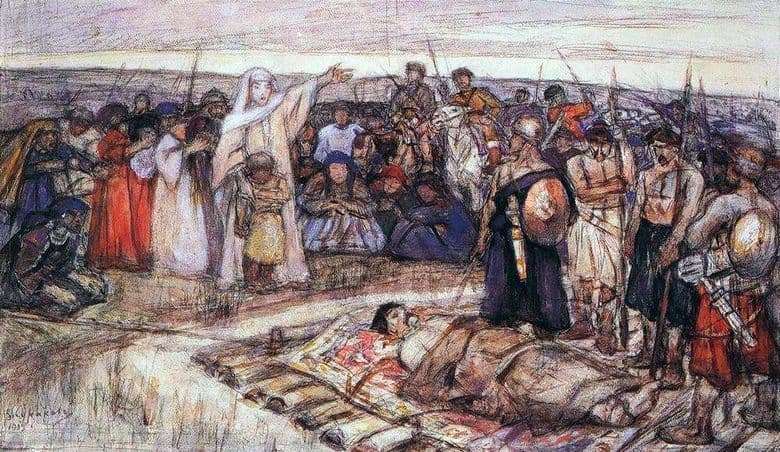 In the 10th century, Prince Igor went with his team to collect tribute from the Drevlians, but the recalcitrant subjects rebelled and killed the prince. His lifeless body was brought to the widowed princess. Knowledge of the history of this event helps to understand this work of Surikov. Here is the princely army. All men are armed. Each of them has a weapon on his belt, and soldiers are holding shields on their backs or in their hands. Some warriors are armed with spears and pikes. The clothes on men are not entirely military: some are stripped to the waist, on some – just a light dress. Behind are the warriors on horseback. Before the warriors settled women. This arrangement of figures is very symbolic. For a woman in those years to lose a husband is a great sorrow. The widow will not be able to feed herself or the children, she is doomed to a miserable existence. Therefore, all women are depicted on their knees, as if in the pose of the worshipers. There is sorrow and regret on their faces. The artist also wanted to show us that the murder of a prince is not only a loss for Princess Olga. All women, figuratively speaking, are now left without a patron. Despite the fact that the work is not finished, many figures and faces are not drawn, we understand the mood of people. The artist showed not only grief, but also raging passion, a thirst for revenge, anger. The central figure of the canvas is Princess Olga. With one hand she holds her young son. Her second hand is a call to start a bloody war. In the foreground is the body of the murdered Prince Igor. The man was laid on a patterned carpet and covered with a light sheet. The work background is not drawn.